Steve Ray here. My kids and I recently pooled together all of our resources and bought land way out in the country on a river with a forest. My daughter and son-in-law's house is already half built and the rest of our family plans to join them soon. Lord willing, I will semi-retire there with all my kids and grandkids surrounding me. 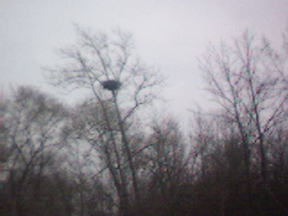 In the middle of our forest, there's an eagle's nest. 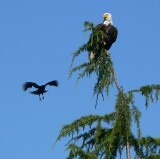 Over the last few years we've enjoyed observing the two eagle parents as they raise their young. But it is interesting to watch the lesser birds, such as noisy crows and blackbirds, since they don'tblike the eagles. The eagles are bigger and fly higher, they are threatening to the lesser birds. The eagles eat fish and small mammals and have no interest in the crows and blackbirds — they basically ignore them. The same thing happens in human society too, even among Christians. I will explain what I mean. But first, Dr. Francis Beckwith (interview here), is the former president of the Evangelical Theological Society (a respected and honored position his noisy critics could never dream of achieving). He has an earned doctorate and an impeccible reputation. He was recently received into full communion with the Catholic Church. Not only did Catholics welcome his entry into the Catholic Church, but many of his more mature, knowledgeable and charitable Evangelical associates regarded his decision with respect too, even if they did not agree with his decision. Dr. Beckwith has flown high enough to see the big picture. He is respected the world over as an honest, knowledgeable and respected theologian with great integrity, but there are always noisy crows and blustering blackbirds sitting at their computers who think their raucus attacks and fluffed up feathers prove they are better than the eagle. If it wasn't so pathetic it would be funny. But as we've watched our eagles, we've learned that the eagle is wise to ignore the blackbirds and continue flying high. We've noticed that the eagle can always outlast the smaller birds. It rises higher and higher and the less capable and short-sighted blackbirds eventually drop out of site. The eagle soars to the clouds — leaving his know-it-all critics behind and seeing things from an even higher perspective. By the way, few people notice the crows, but many love the eagles. And like most Christians, I find it best to ignore the noisy crows myself; they are a waste of time.